This isn't Cadbury Creme Egg-infused coffee. This is mayonnaise, people. Mayonnaise!!! There is a certain egg-filled holiday coming up, and as usual, the people at Cadbury are stepping up their publicity game. But this year, they may have gone too far. First, Cadbury replaced its iconic Easter bunny with an English Bull Dog (honestly, though, cutest thing to happen this spring). And now, they're collaborating with Heinz to turn their candy into a condiment. Unfortunately, it's not a candy-filled collaboration with Nutella. 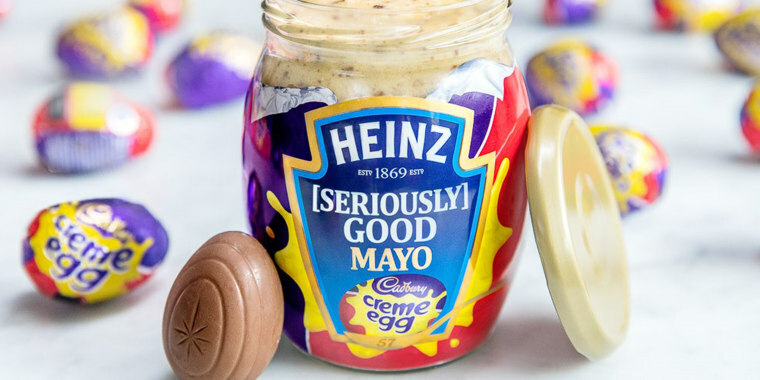 It's two individually delicious things that should never, ever be combined: mayonnaise and Cadbury Creme Eggs, the combination of which is dubbed, very questionably, "[Seriously] Good Mayo." Needless to say, Twitter isn't exactly happy. A (very) select few are at least a little intrigued by the flavor pairing. Maybe after a few drinks. Step 1. Realise slightly drunk isn't going to cut it. Mostly, though, people are in agreement that some aspects of nature should not be tampered with. But, to their credit, Cadbury UK and Heinz Mayo will not be discouraged. In a release, Heinz and Cadbury said the spread was created "in a moment of taste bud tingling brilliance." Luckily, Americans can continue to sip their less-controversial Cadbury Egg Frappuccinos and shop the condiment aisle without fear of encountering this salty-sweet concoction. This limited-edition spread will only be available in the UK. The [Seriously] Good Mayo, which they say is meant to dollop on waffles or crumpets (because, again, this is the UK), will be available from Thursday to Saturday at a Heinz-Cadbury pop-up store in London's Ely's Yard. As for how it tastes, the brand is keeping it vague, calling the mayo "scrumptious." "It’s unlike anything you’ve ever tasted before," said Heinz brand manager Martina Davis, "a true taste sensation! If everyone loves it as much as we do, then who knows, we might have to roll it out nationwide one day." For those of us in the US, hopefully "nationwide" only means in the UK. But honestly, in a country where Peeps pizza was invented, we wouldn't be shocked to see it here on store shelves in time for Easter.